Organized each year on 8 November by the main radiological societies, the International Day of Radiology (#IDoR2017) is a joint initiative of the European Society of Radiology (ESR), the Radiological Society of North America (RSNA), and the American College of Radiology (ACR). The choice of this date owes nothing to chance, since it was on 8 November 1895 that Wilhelm Conrad Röntgen discovered the existence of X-rays, a major discovery that earned him the Nobel Prize in Physics in 1901. Since then, medical imaging has continued to evolve and new techniques have been developed, reinforcing the effectiveness and quality of care. Thus, the objective of this day is to raise public awareness not only about the role of imaging in modern medicine, but also about radiation safety and the radiologist’s profession in the patient’s treatment. Focusing this year on the theme of emergency radiology to highlight the essential role that radiologists play in the emergency room, more than 100 radiology-related societies around the world will celebrate this day by organizing press conferences, public lectures, department open days, and interviews with experts in the field. According to a survey conducted as part of the French Radiology Congress (JFR) in 2014, 40% of emergency admissions also entail a medical imaging examination. The modalities most frequently used are conventional radiology (71%) and scanner (23%). The scanner is used by 2 out of 3 practitioners for drainage and other interventional imaging procedures. Following an interventional procedure, the patient has possibly received a high dose of radiation. There is a real need to assess the patient’s cumulative skin dose, especially after interventional radiology. The Peak Skin Dose module, integrated in the DACS RDM, contributes to better follow-up and better care of the patient from a dermatological point of view, while providing a complete dose history. Furthermore, with regard to the PSD module, 4 hospitals of the AP-HP group have conducted a study to validate RDM’s new skin dose mapping feature. The RDM solution was compared with experimental measurements using Gafchromic® films − first performed on anthropomorphic phantom, and then on patients in routine clinical conditions (read the article). The first results were presented by Bouchra Habib Geryes, a Medical Physicist at the University Hospital of Necker Enfants-Malades, during JFR 2017: On average, there is less than 10% difference between RDM’s solution and the measurements using Gafchromic® films. o Calculation of the organ dose, including the dose received by the fetus. RDM can give an estimation of the dose received by the fetus during the different stages of gestation. o Ability to write into RDM whether the patient is, is not, or is likely to be, pregnant. o Specific alert rules for pregnant women: the alert ends with the end of term. RDM allows healthcare professionals to give special attention to the justification and optimization of radiation − particularly in the emergency situation − taking both the mother and the child into account. This year, in order to raise public awareness of the need to increase radiation safety, Medsquare has chosen the image of an umbrella as a sign of patient protection. This communication reflects the added value of the RDM solution in terms of dose optimization and patient radiation protection. 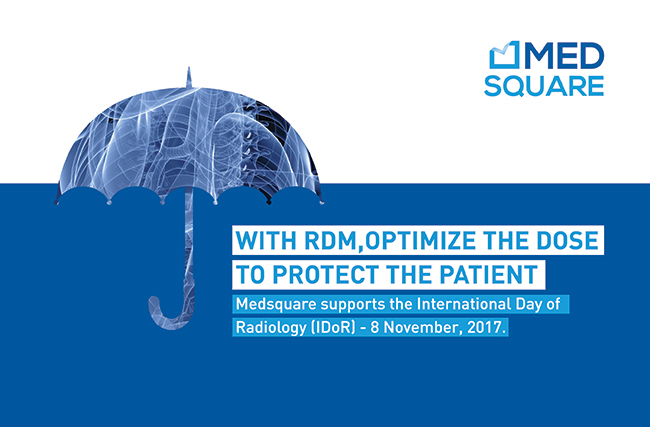 The slogan − “With RDM, optimize the dose to protect the patient” − was chosen for the communication created for the International Day of Radiology on 8 November 2017.